The federal Liberal government tabled legislation Tuesday to protect Indigenous languages in Canada — many of which are facing extinction because of a shortage of speakers after centuries of colonialism. The legislation sets up the Office of the Commissioner of Indigenous Languages, a new federal entity meant to protect and promote such languages as Cree, Ojibway, Oji-Cree, Mohawk, Mi'kmaq, Michif (the native tongue of some Métis) and Inuktut, among dozens of others that are still spoken in Canada with varying levels of fluency. Heritage Minister Pablo Rodriguez said that, with the new Bill C-91, the federal government is working for the "provision of long-term, sustainable funding of Indigenous languages" and to "support the reclamation, revitalization, strengthening and maintenance of Indigenous languages in Canada." The new office will be tasked with: planning "initiatives and activities" to restore and maintain fluency in Indigenous languages; creating technological tools, educational materials and permanent records of Indigenous languages, including audio and video recordings of fluent speakers; and funding immersion programs. The office also will undertake further research on existing and extinct Indigenous languages. While stopping short of granting any particular Indigenous language official status on a par with English or French, the bill allows for the translation of federal documents into Indigenous languages and interpretation services to "facilitate the use of an Indigenous language in the course of the federal institution's activities." The Indigenous languages commissioner, like the official languages commissioner, will be chosen by the federal cabinet and appointed to a five-year term. Rodriguez said the new legislation satisfies three calls to action from the Truth and Reconciliation Commission (TRC), the body that studied the legacy of the Indian residential school system. That system has been blamed for forcing young Indigenous students to learn English or French to the detriment of their original tongues. "We're losing all Indigenous languages in the country. They're all threatened. We have to make sure that they're able to keep their language, to revitalize and to be able to tell their own stories in their own languages," Rodriguez said. "Some [languages], you have a handful of people remaining that speak the language and they will disappear in a matter of a couple of years." 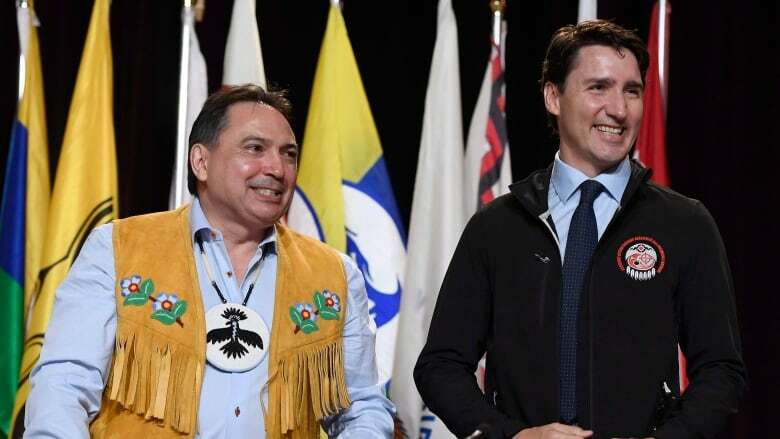 Assembly of First Nations (AFN) National Chief Perry Bellegarde, who has made language preservation a priority, praised the legislation Tuesday, calling it a step forward. "No Indigenous language in Canada is safe. But now there is hope. This legislation will support First Nations efforts to keep their languages alive, vital and strong. Canadians and all parliamentarians must support this bill because we all understand that language is identity, language is culture, language is life," he said. The federal government said it would work with provinces and territories to bolster Indigenous languages nationwide. Bellegarde said he'd like to see the rollout of bilingual language programs for schoolchildren to encourage early development. While the legislation is supported by national First Nations and Métis groups, the Inuit Tapiriit Kanatami slammed Ottawa's efforts as woefully inadequate. Unlike many other Indigenous languages, Inuktut is widely spoken by the Inuit in the territories and the northern reaches of Quebec and eastern Labrador. "Despite being characterized as a reconciliation and co-development initiative, the government of Canada engaged Inuit in bad faith throughout this legislative initiative," Natan Obed, the president of the ITK, said in a statement. "The absence of any Inuit-specific content suggests this bill is yet another legislative initiative developed behind closed doors by a colonial system and then imposed on Inuit." Obed said the Office of the Commissioner of Indigenous Languages is little more than a new title for the existing Aboriginal Languages Initiative Program, a federal office that has largely failed to halt the decline of Indigenous languages despite having a mission similar to that of the new Liberal plan. "Unlike provincial and territorial languages commissioners, the national indigenous languages commissioner will be a powerless advocacy body, perpetually burdened by costly and onerous reporting duties. It will be controlled by the federal government and serve to consume resources best directed to indigenous peoples ourselves," the ITK said. The ITK said that, despite the new legislation, there is no obligation on the part of Ottawa to fund Indigenous languages, nor does the legislation provide reliable federal supports.